It's hurricanes like Earl that make it so difficult for emergency planners to convince the public just how dangerous hurricanes can be. 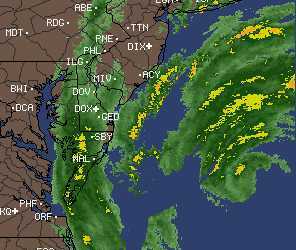 The storm past Rehoboth Beach Friday afternoon, more than 150 miles from shore. According to the boardwalk DEOS weather station, the hurricane brought a measly 0.04 of an inch of rain the entire day and a maximum wind gust of 20 m.p.h. recorded at 9:58 a.m.
At 2 p.m. Earl was 163 miles from Rehoboth Beach, and this is what Earl looked like on Intellicast.com weather RADAR. High tide came all the way to the dunes in most areas. But the mild weather welcomed beach goers hoping to catch a glimpse of a hurricane. Chick here for more Hurricane Earl photos. A 21-year-old Salisbury man, who had been missing for a week, was discovered dead inside his Toyota Corolla in the Rehoboth Kmart parking lot. The discovery was made around 2:15 p.m. on Saturday. Officials say the body appears to be that of Alex Xavier Arroyo-Flores. He was found in the back seat of the car. The Corolla appeared to be properly parked in a parking space across the parking lot opposite the main entrance to Kmart. Flores was the manager of the Fruitland McDonalds, where he was scheduled to work the previous Friday, but never arrived. Wicomico County detectives said last week that foul play was not suspected. Flores was a diabetic. The Daily Times had reported these details on Flores' disappearance from his family and coworkers. Since the discovery, many comments from Kmart workers and Flores' family/friends have been posted on the WGMD Website. Hurricane Earl may have helped bring a whale carcass to shore at the Cape Henlopen State Park on Friday. Experts from the MERR Institute performed a necropsy on the whale early Saturday just south of the point, north of the beach crossing on the ocean side. There were lots of spectators. The 31-foot male fin whale had been found dead near the Point, and was later brought ashore. Preliminary findings suggest the whale died from blunt-force trauma which broke its back in 10 places. It had been dead approximately three days before it floated ashore. Some of the remains will be taken to the MERR lab for further study. The rest was buried just below the dune line in the state park. 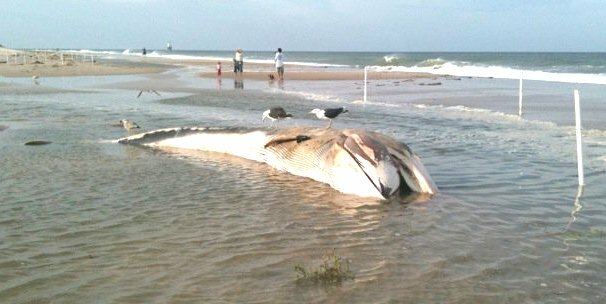 This was the third dead whale MERR has responded to this year. See this Daily Times Article for more details. REHOBOTH TRESPASSER CAUGHT ON VIDEO! One Rehoboth Beach property owner is frustrated by drunks urinating in his yard and vandals causing mischief to his property. So he installed a surveillance system five years ago to help identify the culprits. Early Saturday, Rick Eisenman's security cameras captured images of this man. The video shows him walking into Eisenman's yard without hesitation, as if he knows where he is going. While holding his flip-flops in his right hand, the man appears to reach for his zipper as he walks out of view of the video camera. 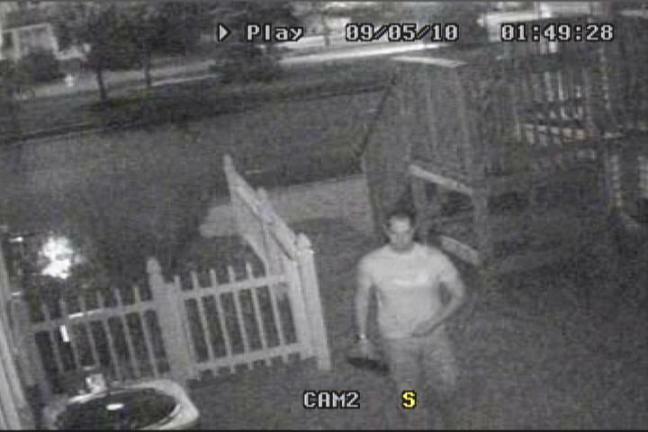 Eisenman says he suspects this man has urinated in his yard in the past. "We have been finding the same wet spot under the window for weeks," Eisenman says, "and think this is the same guy from last summer." "Property owners need to be cognizant of what lurks in the early morning hours in this town," Eisenman adds. Click here to watch Eisenman's security video (this 948 KB file may take several minutes to load for low-bandwidth users). He asks anybody who knows this man to call Rehoboth Beach police. TOWS FROM REHOBOTH LIFEGUARD SPOTS PLUMMET! Tows of unauthorized vehicles parked in Rehoboth Beach Patrol parking spots is at the lowest it has been in five years! This summer, the beach patrol requested police only twice to remove unauthorized vehicles when the guards returned from their lunch breaks. There were also two more that were removed when guards reported for work during the morning. That is the lowest in five years. Why the plunge in tows? There does not seem to be a single reason. The reserved spaces appear to be more clearly marked. In 2006 and 2007, the city had removed more than 20 vehicles, about a third of which came from this sometimes-contested parking space on Stockley Street. When an unauthorized vehicle was found in a reserved lifeguard spot this summer, the guards in some cases asked the police to simply issue a ticket, or take no action at all, assuming the guard found parking. * This list only shows lunchtime tows, additional tow requests were made in the morning when guards reported for work. This Honda Civic was one of only four vehicles towed from parking spots reserved for Rehoboth Beach lifeguards this summer. A guard reported it in the parking space on Brooklyn Avenue on Monday, July 26, when returning from a lunch break. At the time, the parking meter had been fed with more than 30 minutes remaining on it. RIGHT PARKING SPACE, WRONG CAR? This weekend Rehoboth Beach police were summoned to another towing dispute. This one took place in the parking lot next to the Rehoboth Mews on Baltimore Avenue. Onlookers watched while a police officer sorted out what happened with Coastal Towing, the owner of the car being towed and the shop next to the parking lot. The witnesses said that the tow truck had been requested to remove an unauthorized car parked in the lot in the space next to the fence. But before the tow truck arrived, the driver of the unauthorized vehicle departed. Meanwhile, another driver, who was supposedly authorized to park in that lot, parked his Lexus in that same parking space. So when the tow truck operator arrived, he hooked that vehicle. Witnesses described how hard the tow truck driver worked to manipulate the Lexus out of a tight parking spot. The driver of the Lexus arrived around 8:20 p.m. Sunday just as the car was being removed from the lot, and that is when police were called. The tow truck driver wanted his show-up fee. The tow truck driver got his show-up fee, and the operator of the vehicle being towed said he would take it up with the lot owner at a later time. Just as Hurricane Earl was whipping up the wind and seas, officials in Rehoboth Beach received a report that an occupant on the 4th floor of the Henlopen condo spotted something yellow bobbing up and down out in the water, possibly a raft or life jacket. The report came in around 6:10 a.m. Friday. Rescuers quickly realized that what the caller was seeing was the pair of buoys placed off the beach Tuesday afternoon for Rehoboth's ocean outfall study. See this article for details. REHOBOTH DRAG VOLLEYBALL, AS POPULAR AS ALWAYS! It was one of the most entertaining sporting events of the summer, and it wasn't on ESPN or any TV channel! The little publicized outlandish volleyball tournament with its elaborate costumes, floats, skits and props, draws thousands of spectators. 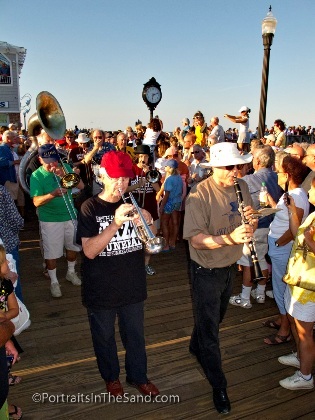 It has become one of the most entertaining shows in Rehoboth Beach. 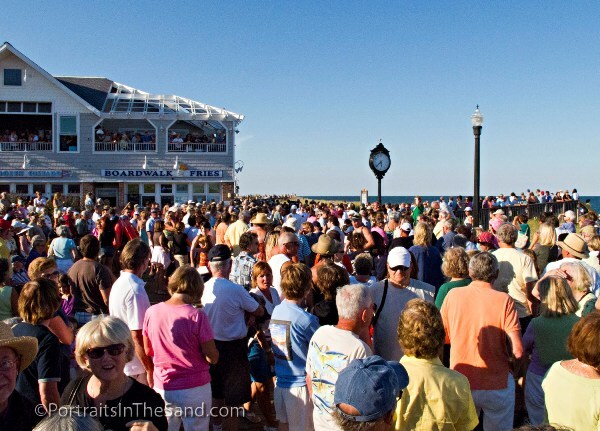 It's free and a Labor Day Weekend tradition in town for more than 20 years! The male volleyball players dress as women and assume different roles. This year's teams were the "Girls of the Gaga Galaxy" and "Trans World Air Atlantic (TWAAT)" stewardesses. Chris Riss of Rehoboth Beach Buzz reports that the stewardesses won the tournament, 17 to 15. The performance is an actual volleyball tournament with regular players. Their often taboo satire is accompanied by planned and unplanned wardrobe malfunctions. The games started in 1988. The tournament is played at the edge of the city's southern border. Read more about the history in the September 2008 Letters from Camp Rehoboth. Cheryl Blackman and Nick Pappas, two Rehoboth Beach boardwalk celebrities pose for a photo. Blackman says she will play a leprechaun during Snow Hill's Chesapeake Celtic Festival in October. WHITE PUMPKIN PATCH IN REHOBOTH SAND DUNES? Perhaps it is appropriate that Rehoboth Beach, which recognizes Halloween each fall with the Sea Witch Festival, have such a plant growing in its sand dunes. All sorts of interesting plants are taking root in the dunes this season. This plant is growing along the dune fence near the Boardwalk Plaza. "That is a type of pumpkin or winter squash," writes Lisa Sexton of Indiana who is a member of the Yahoo Groups Plant Swap e-mail list. She says the blossoms give it away. It could possibly be the white pumpkin known as Lumina, she adds. "The fruit will continue to develop and will eventually look like its final product when the underside starts to turn a slight yellow color. This is true of most of the squash family." Continuing with last week's photos, here is yet another petunia growing in an odd place in Rehoboth Beach. This one is tucked under a planter (which has no petunias) on Baltimore Avenue in front of Hobo's Restaurant! LAST WEEKEND UPDATE FOR 2010! This is the 15th and final weekend update for the 2010 season. Thank you very much for your continued support. Please keep the e-mails, photos, articles, announcements and news releases coming. Have a great winter and hope to hear from all of you next season, if not sooner! 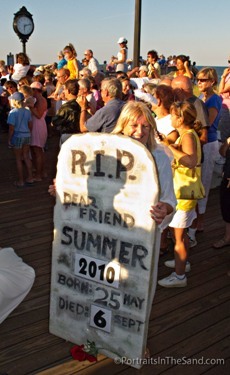 Only 262 days until Friday of Memorial Day Weekend 2011! WOMAN TAKEN TO HOSPITAL AFTER LIP RING INFECTION--- A 24-year-old woman who had her lower lip pierced this past week had a lip so badly swollen on Friday, she called for an ambulance. Her lip was so swollen she could not remove the lip ring. She was in severe pain and having trouble speaking when the Rehoboth Beach ambulance took her to Beebe Hospital around 9:30 a.m.
REHOBOTH POLICE NAB SAME MEN TWICE IN ONE DAY--- A seasonal police officer caught two men sleeping on the boardwalk at Baltimore Avenue around 7 a.m. Saturday. Police detained them for lack of ID and later wrote a citation for sleeping on a bench. Around 12:15 p.m., police received a complaint that two intoxicated men were sitting on a bench near First Street Station. They were the same men, and were placed under arrest. BAT BITES GIRL? Ocean City EMS personnel were called to Old Landing Road around 8:40 a.m. Saturday after a 4-year-old girl reportedly was bitten by what looked like a bat that swooped down from a tree near the "Our Place at the Beach" Condo. She was supposedly bitten on the shoulder. PERSON FOUND DEAD NEAR O.C. 'S PARTY BLOCK--- Police discovered a person in cardiac arrest in the area of The Party Block in the 1700 block of Philadelphia Avenue around 2:55 a.m. Monday. The patient was taken to Atlantic General Hospital and pronounced dead. Police have released few details. Here is what WBOC-TV is reporting on its Website. O.C. POLICE TARGET SCOOTER RIDERS WITHOUT HELMETS--- Ocean City police issued traffic citations to nine people for operating a rental scooter without a helmet. The citations were issued Sunday between 24th and 41st streets. WOMAN CRITICALLY INJURED IN REHOBOTH MOPED CRASH--- A 58-year-old woman was critically injured after she crashed her moped on Coastal Highway south of the Rehoboth canal bridge. It was reported around 12:55 a.m. Friday. Cpl. Bruce Harris, state police spokesman, says Barbara McMullin, of Bear, Delaware, was riding her silver Sunbird scooter south when it overturned for an unknown reason. Tim Cooper, Sussex EMS spokesman, says she was taken by ambulance to the Rehoboth Elementary School where she was flown to Christiana Hospital in critical condition with suspected head injuries. Cpl. Harris says McMullin's condition is unknown as of Monday, but it did not appear to be life threatening. Cpl. Harris says "a preliminary Delaware State Police investigation suggests alcohol to have been a factor. Charges against McMullin are pending." MAN INJURED IN O.C. SURF, FLOWN TO TRAUMA CENTER--- The only surf injury that required a medevac this weekend was for a 59-year-old man who struck his head while body-boarding in the surf at 94th Street in Ocean City. It was reported around 12:10 p.m. He was unconscious and had to be pulled to safety by lifeguards. When he finally regained consciousness, he could not recall what happened, and complained of numbness and tingling in his arms and legs. He was taken to Northside Park where a helicopter flew him to a trauma center. Saturday 3:15 p.m., two swimmers were reported 50-70 yards from the beach possibly in distress near 3R's beach in the Delaware Seashore State Park. A Coast Guard vessel was the first to reach the swimmers who had a blue boogie board. They were told to swim back to shore. They did not appear to be in distress. Saturday 3:45 p.m., two kayakers were reported possibly in distress off Bay Avenue in Slaughter Beach. One made it to shore and the other was assisted by firefighters. Five fire companies along with the Coast Guard, DNREC and the state police helicopter were called to assist. Saturday, 11:55 p.m., five occupants were thrown from a 21-foot Carolina Skiff near the mouth of the Murderkill River. Three were found right away, but two men were missing. A massive search was initiated that included the Lewes fire boat. The men were spotted by the Coast Guard more than an hour later walking through knee-high water. They were suffering from exposure. For more details, see the WGMD Website. Sunday 4:15 p.m., a 21-foot MAKO started sinking more than 5 miles from Big Stone Beach. Rescuers from one of several fire companies called to assist arrived 30 minutes later. The stern of the boat had already sunk below the surface. Monday 6:20 p.m., a Boston Whaler boat was out of control spinning in circles around its two occupants, a man and a woman, after they ended up in the Rehoboth Bay near the West Bay Park marina. The 22-year-old woman was taken to Beebe Hospital by ambulance. She had been struck in the head by the boat as it was circling out of control. The man left the scene in a private vehicle, supposedly going to the hospital as well. But DNREC marine police were trying to locate him since he was the suspected operator of the boat. Two lifeguards reportedly went in to assist the boaters who were also assisted by a pontoon boat. The Boston Whaler continued to circle out of control for about 25 minutes before it ran aground on an island. Crash closes eastbound Route 90 outside Ocean City, again! News leads and photos are appreciated! Please e-mail alan@henney.com or call 302-227-9160. Also try AOL or Yahoo instant-messengers or Facebook, Twitter or MySpace (all screen names: AlanHenney). Listen for the Henney Report on 92.7/WGMD-FM's Monday morning show with Dan Gaffney!